It was 1973, near the end. Our team was in Cambodia on a reconnaissance mission. We weren’t supposed to be there according to the rules, but it was necessary in a war that had no rules. Intelligence had reported a buildup of North Vietnamese regulars that had come down to Ho Chi Minh Trail, and our mission was to observe them and report back. Everything was going fine until we interdicted a patrol. Confrontation was unavoidable and although we came through without a scratch, the whole of the enemy camp was alerted due to our close proximity at the time. They were on us in no time. There must have been a battalion of them. The first to get it was Operations Sergeant. Two more men fell and then the Captain. We fought our way out with a modified pincher offensive. Half of us made it, half were dead. We couldn’t carry them out. The radio was destroyed, as well as our operator, so we were completely on our own. No way to call in for a lift out. They hounded us all night. They must have had our scent, so to speak. And, of course there were so many, that all they had to do was spread out, which they did. They caught up with us again before daybreak. Luckily, it was a small patrol, I thought. But they had a .50 caliber machine gun, one of ours captured from a previous encounter. How they moved with it so fast, I’ll never know. When they opened up with that thing, all hell broke loose. At the end of the fight, only two of us were left. For a while, a very short while, I thought the two of us would make it out. Of all the fellows on the team, I was the closest to him. I really felt bad about losing everyone else, but the fact that my best buddy of my whole life was with me made me feel good. My friend got hit in the legs. It was a long shot but his legs were nearly separated from the rest of him. The main artery in his right leg had a hole in it and he was going fast, but not fast enough. I sat down on a fallen trunk. There were fifty miles between me and safety, and I had no idea where I was. That’s when I saw her……just a bit ahead of me, an Indian Maiden, with a glow about her. Now I would call her a Native American Princess, but back then, I just recognized that she was of one of the North American Tribes. She signaled for me to come, which I did. She moved through the jungle with such grace and purpose as I have never seen before or since. And, I felt such a sense of peace and security in her presence that I found a renewed strength to keep on going. She always stayed ahead of me, but not too far. All I could do was to follow. My mind was inquisitive and I felt like a child. And yet I felt a strength in me of ten men. She zigzagged here and there, but always went forward. My legs should have been getting heavy, but I felt like I was walking on water. I followed her all day. Whenever I said something, she just turned and smiled. I was getting tired by nightfall and my vision was getting fuzzy. But the Angel in Deerskin touched me, somehow, and I received new strength. My legs felt like water but now I did not stop. I just had to catch up with that beautiful maiden with a glow about her. The next thing I knew I caught sight of the compound,. When I got in and was questioned, I asked, “Since when are we using WAC’s in Indian clothes as guides?” The officer called in the Sergeant to show me a bunk I could sleep in, as I surely needed it. I never forgot her face, or her beautiful, graceful body for that matter. It wasn’t until I saw her picture on the leaflet for the Catholic Charities Appeal that I found out who she was. There were some differences, but that was her. I followed her through fifty miles of jungle. She has been leading me back ever since. Someday I hope to meet her again, face to face. 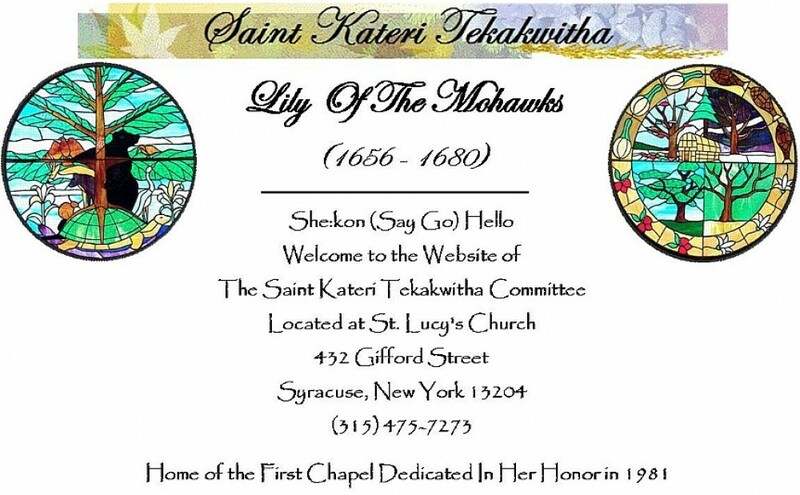 Her name was Kateri Tekakwitha.